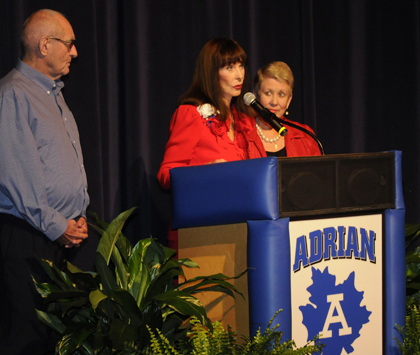 Inviting her high school best friends to the stage, Julia Argyros, surprised the audience assembled for the Adrian Schools Educational Foundation-Adrian High School Alumni Association Outstanding Alumni Awards Thursday night announcing a $1million gift to the Adrian Schools Educational Foundation Arts Endowment. “There are no two people who have worked harder for this Foundation than Julie and Allan Brittain, and it is an honor to make this donation in recognition of their passion for Adrian Schools,” said Argyros a graduate of the class of 1958. Argyros, who is president of the Argyros Family Foundation in Newport Beach, California, thanked her husband, George, a prominent California businessman, for all of his hard work that created their Foundation, making the gift to her alma mater and hometown possible. George and their daughter Stephanie, were also in attendance at the event showing their support of the gift. “There are many memories that Julie and I share, and Adrian gave me a grounding that will never be taken away,” she told the audience. Julia was honored as an Outstanding Alumni by the ASEF for her philanthropy passionately supporting health care, education, neglected children, and the arts. She served in an ambassadorial role with her husband who was appointed an ambassador to Spain under George W Bush. She was recognized for a gift to the ASEF in 2008 which began the Arts Endowment so that Adrian Public Schools would always be able to have a full arts offering K-12. The Foundation uses a small portion of the interest generated by the investment to provide opportunities in the arts above and beyond the district budget. Revenue from an Adopt-A-Seat program in the District’s 630-seat theater also goes into the endowment and is used to give back to the arts programs as well. Earlier in the day, the Argyros’ also awarded a $1million gift to the Croswell Opera House, citing its importance to Adrian and the students who are able to perform on its stage.